It’s been a few days since I picked up “Tofu”, 2019 Mazda Miata, and I just passed the first 200 miles. I have been easy on the car so far, planning a break in by gradually raising the max RPM I use, starting from 4000rpm for first 100 miles or so, and then 5000rpm, and I just start hitting 6000rpm just today. Hopefully I’ll hit around 600 Miles before my first event. However, up to the RPM, I try to accellerate fairly quickly. Any how, here’s my very first impression of the ND2 Miata. It is comparison to NA or NB Miata. 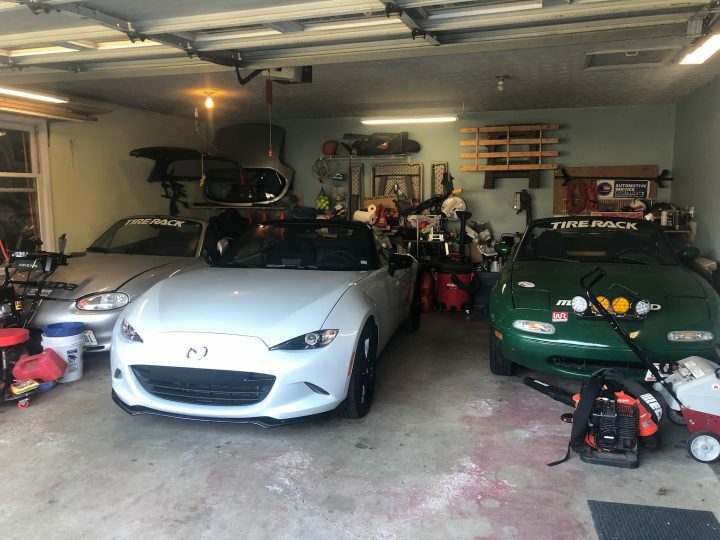 Completely stock, base model NA6 (1992, 1.6L), and E-Street autocross prepped NB1 (1999 1.8L) . Suspension on ND2 is very soft. I have noticed the same thing when I test drove ND1 when just came out, but after driving it for a little while, I felt it is very pronounced. It feels very much like NA6 non-bilstein suspension. Stroke feels bit longer compare to NA/NB. I can see some people would not like the roll you feel whenever you turn, or swerve (slalom) the car as it has very pronounced body roll. However, once the roll stops, and suspension settles on bump stops, the car is very stable. Very much like my ES prepped Miata (has revalved Bilstein shocks, stiffer bump stops, with stock springs), and once you learn how to anticipate the roll (start turning steering wheels bit early), it is very easy to drive. There were one part of the road where frequency of the waving road surface matched the suspension, and it made the car very bouncy, but it was just one short section of the road, just a unique occurrence.. It is very powerful. (I’m talking about comparison to NA/NB Miata…) it has great low end torque, and very smooth revs. I can’t wait start beeting my clutch and 1st and 2nd gear at autocross! Feels bit notchy each gear, but that’s probably part of breaking in. Big kudos to Vehicle Stability Control on this car. Quite a bit of improvement compare to RX8’s VSC. On RX8, it did great job keeping the car from loosing control (so it does the job), but at the same time, it does not allow any sliding of the car. As soon as one wheel or 2 wheels start loose grip, it kicks in and fix the issue. I’m not hardly ever drive my autocross car aggressively on the street (it’s already attracting enough attention with all the stickers and big number on the side of car), but every so often, it kicks in when I was not expected and annoyed me. ND2, on the other hand, it is not very intrusive like that. There was one part of the road where farm entrance spread gravel right at the middle of turn in back road, and even then, I barely felt the VSC kicked in. It did allow car to slide a little bit, and maybe, toward very end of the turn, gradually intervene, but maybe not… I know I won’t have it on when I autocross, but for on the street, I feel it will be just fine until I really need it…. I am VERY HAPPY with it! I love using Waze, and even on our Highlander which has Navigation unit, I still use my iPhone with Waze. With Car Play, I can use Waze right on infotainment screen! Even with some little disappointments, such as Mazda disables the touch screen while driving, or cannnot listen to the radio while on Car Play, it is well worth the cost. I know there is a hack you can do to enable the touch screen and probably I can find some pod cast to listen to, but for now, I’m happy enough that I don’t feel Ike messing with the “fix”. One huge surprise to me was how well the Microphone works on this car! I always drive top down, and the only solution I could find in NB was to use some headset to use Siri, and also to make a call. I found the ND microphone is amazing and with top down I have no problem making voice command using Siri, and also when I’m on the phone, I was told my voice is as clear as just holding the phone in a semi quiet room! So far I’m happy with the car. I stil need to get used to the big change of gas pedal became floor pedal instead of the type hang from the top, but that is something I will soon get used to it. Also the car has surprisingly good grip around the corner. I cannot compare this until I drive around the autocross course, but on the street it feels very grippy. I think the soft but very well controlled suspension setup makes car very stable through out the corner, resulting very confident driving. I will be changing the shocks (keeping stock springs), front sway bar, and the alignment, along with wheels, tires, brake pads, etc, so the handling will dramatically changed by the time I finish preparing for autocross. We’ll see how well it gets setup, be fast on the course, without killing the joy of driving on the street! It’s only 200 miles, and I’m sure car will wear in, and settle bushings etc. but so far, I’m glad I got the ND2, and very much looking forward to autocross in it! ← Say Hi to Tofu! Looking forward to seeing it run a course! Are you thinking about running it around Mid Ohio also?